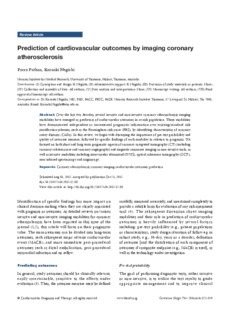 Over the last two decades, several invasive and non-invasive coronary atherosclerosis imaging modalities have emerged as predictors of cardiovascular outcomes in at-risk population. These modalities have demonstrated independent or incremental prognostic information over existing/standard risk stratification schemes, such as the Framingham risk score (FRS), by identifying characteristics of coronary artery diseases (CADs). In this review, we begin with discussing the importance of pre-test probability and quality of outcome measure, followed by specific findings of each modality in relation to prognosis. We focused on both short and long term prognostic aspects of coronary computed tomography (CT) (including coronary calcium score and coronary angiography) and magnetic resonance imaging as non-invasive tools, as well as invasive modalities including intravascular ultrasound (IVUS), optical coherence tomography (OCT), near infrared spectroscopy and Angioscopy.